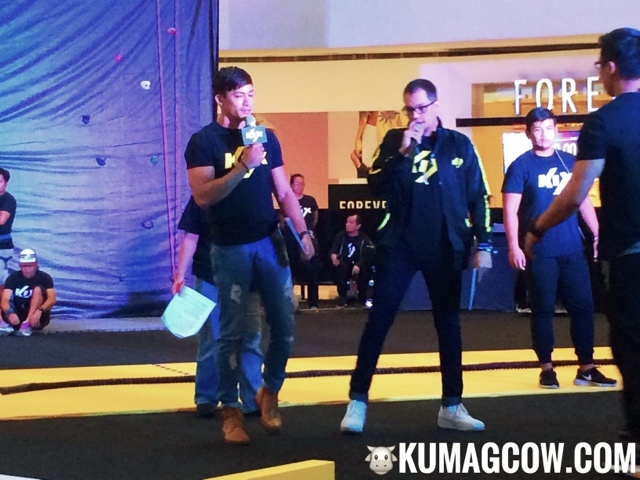 One of my favorite cable channels KIX, the ultimate venue for action and entertainment just concluded their R U Tough Enough (RUTE) search for the toughest Pinoy at the SM North Edsa - The Block this afternoon. The thing is, they have to go through a super hard fitness technical course at the atrium of this mall for the finals. But the winner won't go empty handed because the Champion will get to take home a whopping Php 250,000. That's a quarter of a million pesos ladies and gentlemen, and this is not a drill. During the finals, a bomb expert and policeman, RUTE Ambassador Niel Perez himself was there to root for these finalists! He's been talking to them back stage and he feels they're in the best condition to do this. Aside from that, this isn't just a competition for men because yes, there are women in the group! Alvin Dizer, Cesar Hinayon, Cassie Umali, Ralph David, Lauren Lim, Jennifer Gabriel, Jester Calis, Gabriel Carreon, Robie Oaelmo, Ian Banzon complete the 10 finalists and they have mentally and physically train before this event. When I saw the course, I was already at awe because they need to do a lot of things that would test their strength, endurance, agility, climbing prowess and even pulling a real deal pickup truck! They will be competing against each other and points will be deducted if they don't do it properly. Professional fitness trainers will be watching them like a hawk just to know who the toughest pinoy really is. This event is sponsored by Fisherman's Friend, SM City North Edsa, GSHOCK, Fern C, Gold's Gym, Columbia Sportswear, Mountain Hardware, Kix's cable partners Cablelink, Cignal TV, Destiny Cable, Gsat and SkyCable. KIX is available on Cablelink Channel 54, Cignal TV Channel 133, Destiny Cable Channel 63, Gsat Channel 18 and SkyCable Channel 63. In the end, the winner of the Php 250,000 and tons of prizes is Jester Calis congratulations! It was a tough match with Ian Banzon but you did good.